The influence of Chinese foods on the everyday cuisine of Thailand is everywhere, but often it is in name only. 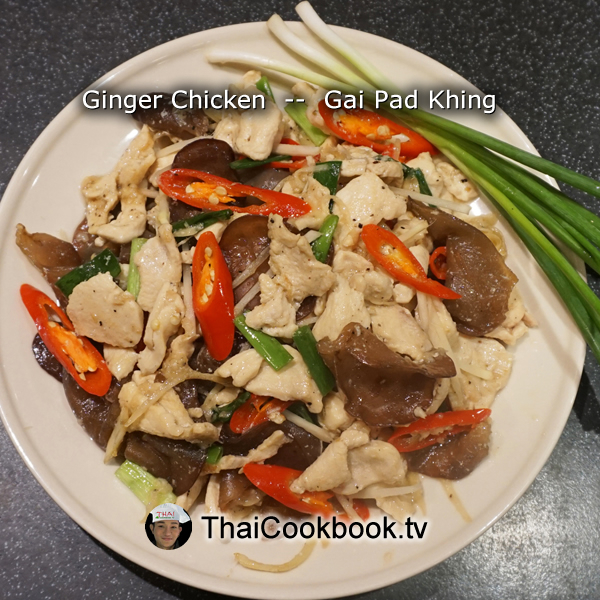 The flavor of this Thailand-style ginger chicken recipe is quite a surprise, with just a hint of spiciness from the addition of Thai long chili. 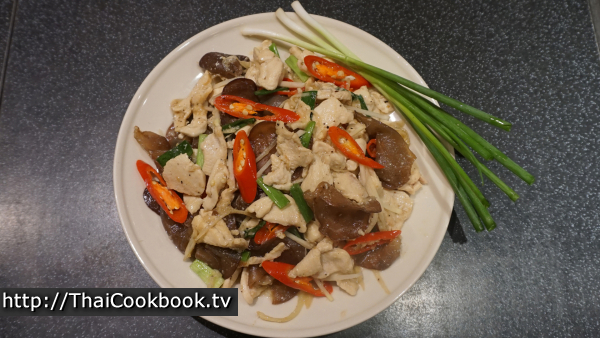 We use wafer-thin slices of chicken breast cooked with a healthy portion of fresh ginger, cloud ear mushroom, and green onion, all in a tasty sauce made with fresh garlic and black peppercorn. What's in our Ginger Chicken. How we make our Ginger Chicken. 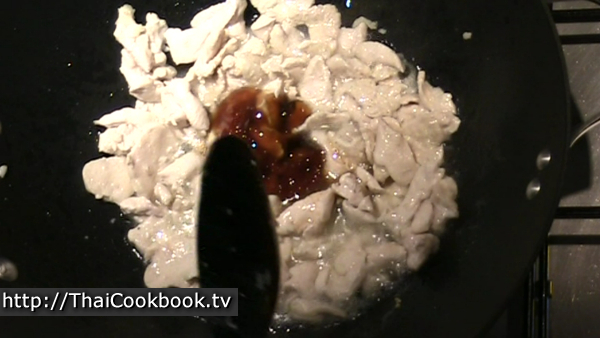 1) Fry the garlic in the oil for about 30 seconds, then add the sliced chicken. Fry for about 2 minutes, stirring continuously. 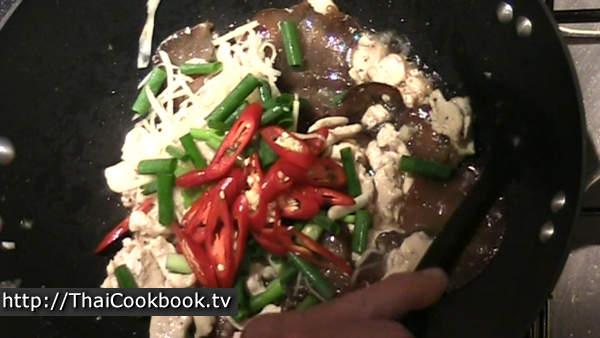 2) When the chicken is nearly done, add the oyster sauce, soy sauce, sugar, and black pepper. Stir in well, and fry until the sugar melts and the pan gets sticky. Add a little water to make a thick sauce. 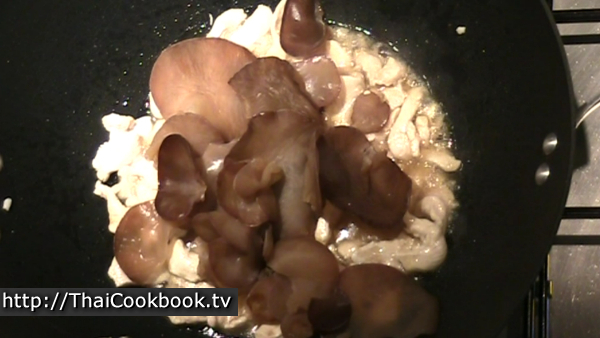 3) Add the Mouse Ear fungus and cook for 2 minutes. 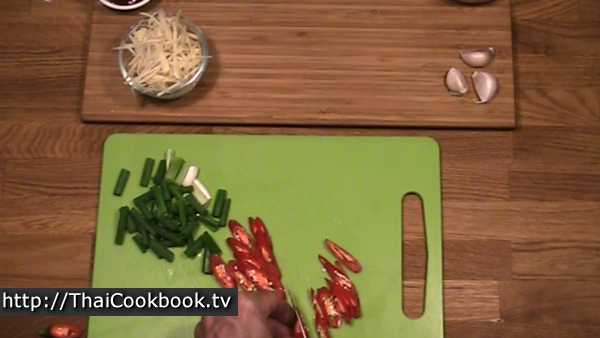 4) Add the ginger, green onion, and red chili. Toss it all well and fry for about 1 minute or until everything is hot. Serve immediately. The Mouse Ear fungus has a hard root section where it grows. Peel or cut this portion off. Tear the 'Ears' into smaller pieces, about 2 inches long. Clean and peel the fresh ginger root, then cut or grate it into very thin julienne slivers until you have about 1 cup of prepared ginger. Cut 2 of the green onions into 1 inch pieces. Save the other 2 whole to use as a garnish. Slice the red chili across on a diagonal. Slice the boneless and skinless chicken breast across the grain of the meat, into very thin slices. 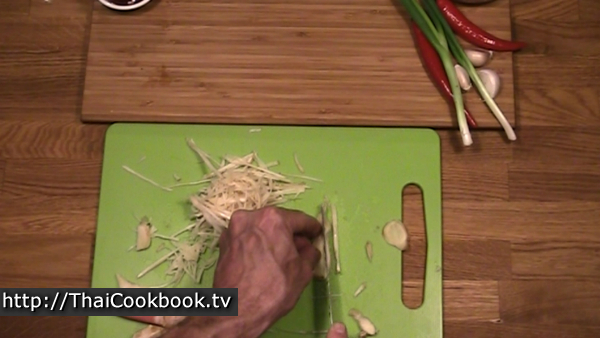 Peel and chop the garlic very fine, or use a garlic press. Grind the black pepper until it is well ground, but not too fine. Get everything ready before you start cooking. 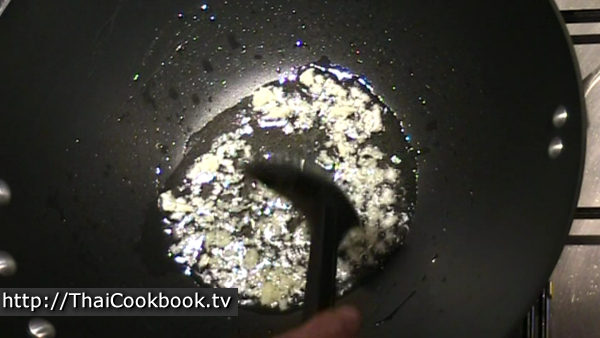 Put the vegetable oil in a clean wok over low heat and let it get warm. Add a few pieces of garlic. When they start to sizzle, add the rest in and fry slowly over low heat for about 30 seconds. Add the chicken and turn the flame to about medium-high. Cook the chicken stirring continuously for about 2 minutes. 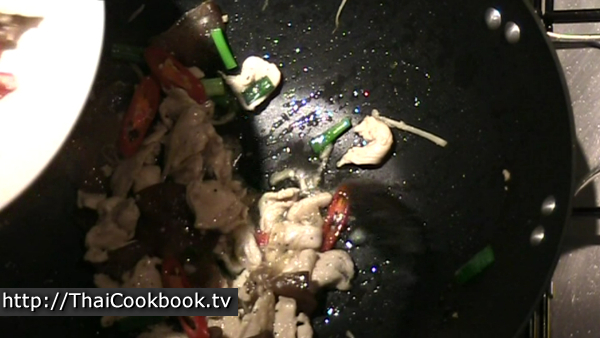 When the chicken is nearly done, add the oyster sauce, soy sauce, sugar, and black pepper. Stir in well. Let it get hot and sticky, then add about 2 tablespoons of water to make a thick sauce. Cook for about 2 more minutes. Add the mouse ear fungus. Stir in well, then cook for about 2 more minutes. Add the ginger, green onion, and red chili. Toss it all up well, and fry for about a minute or until everything is hot. Turn off the heat and serve onto a plate immediately. 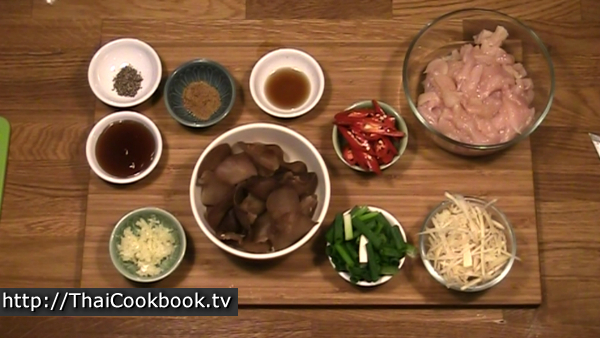 Arrange the ingredient so they look nice, and garnish with whole green onion.